The construction. At the moment, Copenhagen is a building site. Every single main square is being ripped up in order to improve the current metro system. This may be a much-needed improvement but it’s already three years behind schedule, and there are no signs of completion any time soon. Even the bridge connecting the Nyhavn area and Paper Island has not been completed, despite featuring heavily in 2015’s tourist guides. The waterfront, which should be a lovely peaceful promenade is blighted by piles of sand and rubble, holes in the ground, construction equipment, and men in head to toe hi-viz. The weather. Technically this isn’t Copenhagen’s fault. It’s Mr Fletche’s fault for being born in early April, and both our faults for thinking that Denmark would be basking in spring sunshine with clear blue skies. Turns out the weather is just like back home in England. Flat, grey sky. Drizzle. Mist. Two minutes of sunshine which encourages sunglass-wearing and outdoor drinking, only to be disappointed by thick grey cloud by the time you can say “two pints of Carlsberg please”. For a photographer like Mr Fletche, the conditions could not have been worse. If a beautiful building isn’t covered in scaffolding, it’s backdrop is a dreary, white, featureless sky. 😤 We leave believing that the postcards of Nyhavn under a bright blue sky and fluffy white clouds are heavily photoshopped. The prices. We knew that Copenhagen would be expensive. We knew that drinking in the main tourist area of Nyhavn would equal a small mortgage, and that a meal at one of Copenhagen’s many Michelin starred restaurants would cost the equivalent of buying a small island in the Caribbean. What we didn’t expect was for everything to be so expensive. A coffee and a juice (from an admittedly famous chain)? Best part of a tenner. Two beers and a plate of nachos to share? Thirty quid. And it’s not just food and drink. The obligatory tacky fridge magnet souvenir? Close to a fiver. We’re not budget travellers by any means, but it’s hard to justify some of the expenses. Prices didn’t drop significantly away from the tourist centre, and soft drinks were as expensive as alcohol. Even Carlsberg – which flows as freely as tap water in Denmark – cannot be found at any less than a fiver for the equivalent of a pint. To be fair, Malmo wasn’t much cheaper. 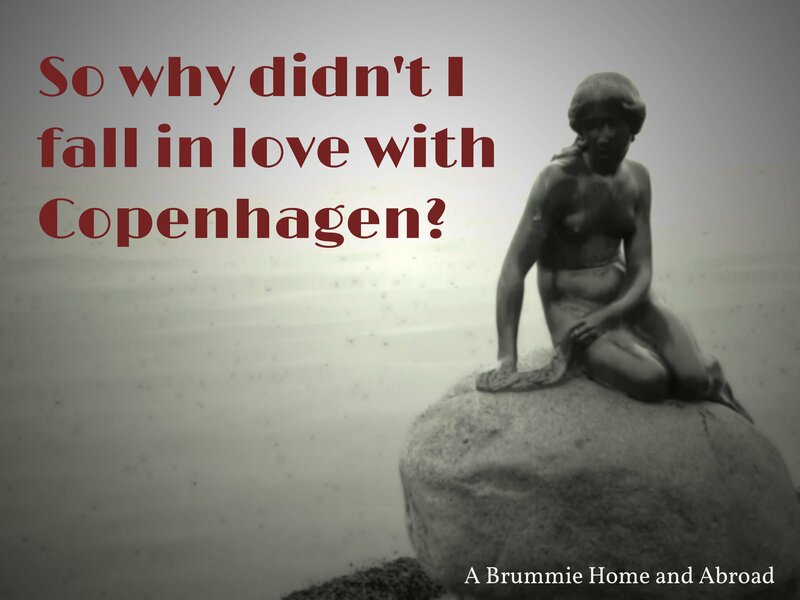 We know we didn’t see the best of Copenhagen, and there is so much that we didn’t get to see in our three days there. But all of the above meant that it was difficult to fall in love with the city like we’d hoped. "Planning a 2 day Copenhagen itinerary"
"Out and About in Brum: March 2016"
I had the exact same weather when I visited Copenhagen, but as I was on my way to the train station to leave the sun was shining, skies were so blue and the whole city looked so different! It’s funny how the weather can affect your experience of a place. If you ever go back, try some of the food markets for more affordable food – more on par with outside London prices and very yummy! It’s amazing what a bit of sunshine can do for a city! We were gutted that we didn’t get over to Copenhagen Street Food as it was only open on our arrival evening, and we never seemed to be at Torvehallerne at the right time! You know, interestingly enough I had the same experience, although I did have pretty decent weather. Copenhagen is just way too overhyped and while parts of it are really beautiful, there just doesn’t seem like much going on. I did visit in the winter and I’m sure in the summer it’s probably a lot better, but I found Stockholm to be a much more interesting place to visit and I wish I had skipped Copenhagen in favor of seeing more of Sweden. Oh and yeah, the prices!!!!!!! Not everywhere is for everyone! I feel like there was just something we were missing that everyone else loved!